BELLEVILLE • The warped metal beam points toward New York City, where it once helped hold up one of the World Trade Center towers. 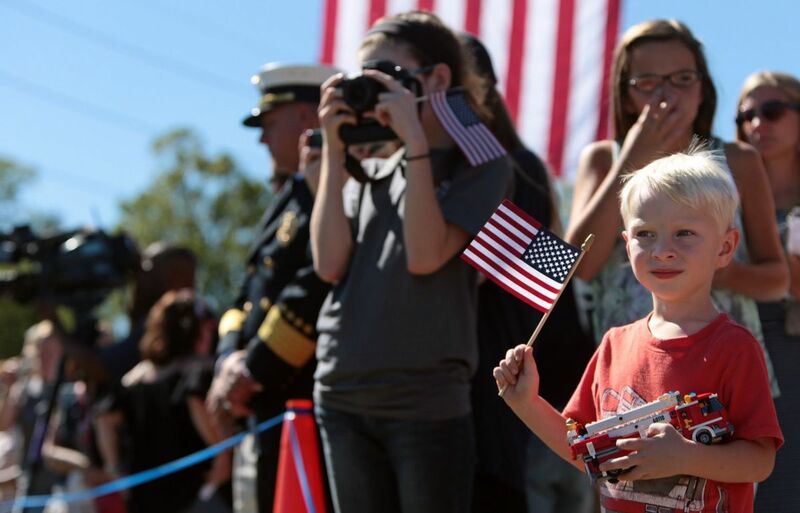 On the 15th anniversary of the terrorist attacks that brought down the twin towers, the September 11 Memorial Walkway of Southern Illinois was unveiled to a crowd of about 1,000 who gathered Sunday at the Belleville Fire Department Engine House No. 4. After an hour-long ceremony, guests walked along a cement pathway reading plaques that tell the timeline of the day, from the time four planes took off in the morning to President George W. Bush’s address to the nation that night. The path ends at a pentagon-shaped plaza in honor of the military headquarters in Washington where one of the hijacked planes struck. There, two concrete posts hold up the beam from the World Trade Center, which lies horizontally in relation to where two planes hit each building. “It was overwhelming to have this show of support,” said Sharon Stausbaugh of the memorial committee. The beam was delivered to Belleville in 2012. More than 1,200 other portions of the towers’ wreckage were sent to cities nationwide, including Arnold and O’Fallon, Mo. Last year it was announced that about 200 artifacts of the rubble that remained from the World Trade Center site, including mangled police cars, an elevator motor and mannequins from underground shops, would be given away by the Port Authority of New York and New Jersey on the condition that the items be publicly displayed. Since receiving the steel beam, committee members in Belleville raised $115,000 from 250 donors for the first phase of the memorial’s construction. An additional $10,000 in donations was designated for a flag pole and engraved bricks. Construction of the first phase started just six weeks ago, with much of the labor donated. Stausbaugh said organizers hoped to have the entire memorial completed by next year’s anniversary. They expect to raise an additional $200,000 for a portion devoted to Flight 93 that crashed in Pennsylvania, additional landscaping, lighting and an area for gatherings. The design includes several symbolic touches. The length of the walkway, 343 feet, commemorates the number of firefighters killed at the World Trade Center. On Sunday, organizers surpassed the goal of 343 firefighters from across Southern Illinois in attendance at the ceremony. Kelly Waldrup, of Shiloh, brought her sons Jordan Uhles, 10, and Joshua Uhles, 8, to the ceremony to honor their uncle Drew Uhles, of Du Quoin. Uhles, a lance corporal in the Marines, was killed on duty in Iraq in 2004 at age 20. Even though the boys were not born on Sept. 11 and never met their uncle, they understand the meaning behind the memorial, Waldrup said. “They’ve been very interested and like to read and ask questions, so they know what this is all about,” she said. Waldrup said the ceremony was very moving for their family, which includes her partner, a state trooper who helped lead the color guard, and a firefighter nephew, also in attendance. She teared up after the steel beam was unveiled. “I’m glad it came to Belleville,” she said.